We produce for Italy and abroad artistic sugar moulds. 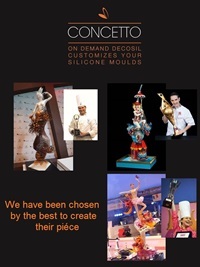 Italian leaders of silicone moulds, we create and sell for over 10 years artistic sugar moulds, food safe silicone moulds worldwide to confectioners, bakeries and Delicatessens. Silicone moulds for frames in sugar to use with transparent isomalt sugar or sugar paste and also with chocolate. This allows to have artistic results of chocolate and sugar for your cake and pralines decorations.